Recently a massive whale floated ashore in the city of Mumbai. 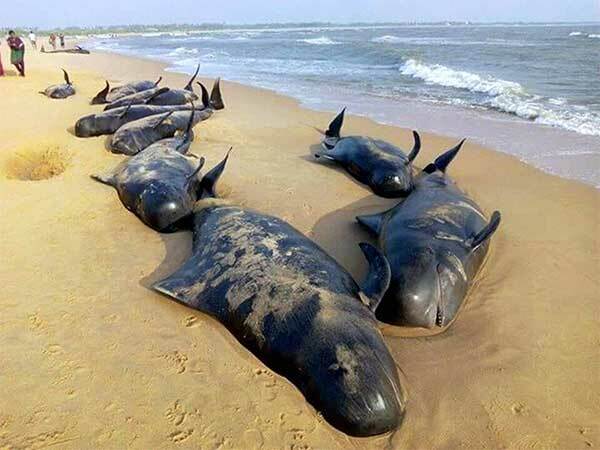 Just a few weeks earlier almost 80 smaller whales had similarly floated ashore in Chennai and scientists could not explain this phenomenon. In all the speculation going around, one site suggested that it was because of plastic microbeads that entered the ocean that this mass death of whales was happening. Outside our office in Pune, nearly 400 trees are due to be felled for year another road widening project. Some of these are banyans at least a 100 years old. News such as these is nearly as saddening as images of migrant Syrian children dying at the shores distant from their burning homes. I have been grieving. We all have – for many years now. And as our hearts overflow with personal, environmental and planetary pain, sometimes the only respite is to turn away from the stories and the images and to look at the empty sky. I cannot change enough. I cannot control this tidal wave of destruction and I cannot contain the grief it creates within. My health has been suffering with the pain I experience and if I don’t find a way of processing this pain, if I don’t find a way to believe in life I will slowly waste away and die. The sky has no answers for me – or so it seems . Just a vast and stainless emptiness that stills my troubled mind. Environmentalists need courage.To fight what seems to be a losing battle. To keep their hearts open even as life seems to extinguish itself in front of their eyes. I seem to have misunderstood something fundamental in my comprehension of Nature and her working. Could it be that I don’t understand the life force itself? That endless creative energy – can it ever be completely snuffed out by the doings of one destructive species? Our work has to move beyond conservation. To accept that perhaps we cannot SAVE anything for long enough, that destruction is part of Natures game. And prepare for the day after. The days after the last forest has been cut down, the day after tsunamis volcanoes and mass extinction of species. We have to learn to look at death in the face and still continue to believe in life. When you allow the grief to cut through the layers of ego, when your heart reaches out in anguish to Nature for help, when your attention shifts from death and destruction into the tenderness of a new born leaf, maybe that is where the transformation of grief into love begins.